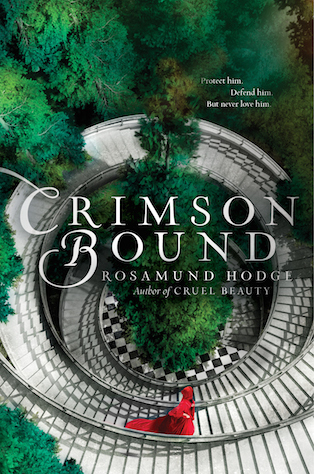 Crimson Bound was an extremely interesting retelling of Little Red Riding Hood. This novel blew me away and kept me reading until the very last page. The mythology behind this story was different from any fairy tale retelling I'd ever read. Hodge wasn't afraid to explore the darkness that was inherent in the original fairy tales (before Disney got ahold of them), and that showed in this book. The character development was fairly well done, though a little lacking. The plot was full of twists, turns, action, and romance. I was pleasantly surprised by this novel. Rachelle was a complex and flawed character, and I really enjoyed reading about her. The POV was third person limited, and it followed Rachelle's journey. She had a tough go of it, and she fought so hard to be good. I really enjoyed all of the different layers to her, and I couldn't help but root for her. I also enjoyed Armand and Erec. They were both extremely interesting and well-developed, too. Erec more so than Armand, in my opinion, but both men had their own personalities. The remaining secondary characters weren't incredibly well-developed, but authors can't spend tons of time on every single character. All of the people in the novel felt real enough, though, and that's what matters. The plot was full of twists and turns. The major plot twist at the end actually shocked, me, even though I feel like I should have seen it coming. I love when that happens. There was also a ton of action in this book. The pacing was pretty fast, but nothing felt rushed. The world-building was done beautifully, though I didn't get a really good feel of what the Great Woods really felt and looked like. The romance was confusing and I didn't really buy some parts of it. I didn't feel the two characters falling in love like I usually do in books when the romance is well-written. However, it worked well enough. I was able to achieve a willing suspension of disbelief, and I couldn't put this book down thanks to the twisty plot. Overall, I'd recommend this book to anyone who loves a good fairy tale retelling. The world Hodge created is dark and full of surprises. You won't be disappointed.